A Surface Manager (SMAN), when combined with Airport CDM allows users to calculate and sequence the shortest taxi routes and deconflict aircrafts in real time. For Air Traffic Management, its algorithms for outing and guidance can be integrated into an Advanced-Surface, Guidance and Control System (A-SMGCS) to implement Level 3. Commonly, Variable Taxi Times are used, an estimate for all aircrafts moving from or to the aprons is a considerable drawback to this type of tool as aircrafts end up having to deal with traffic in real time, stopping to give way to other aircrafts or to wait for access to the runway, wasting precious time, fuel and increasing associated costs. 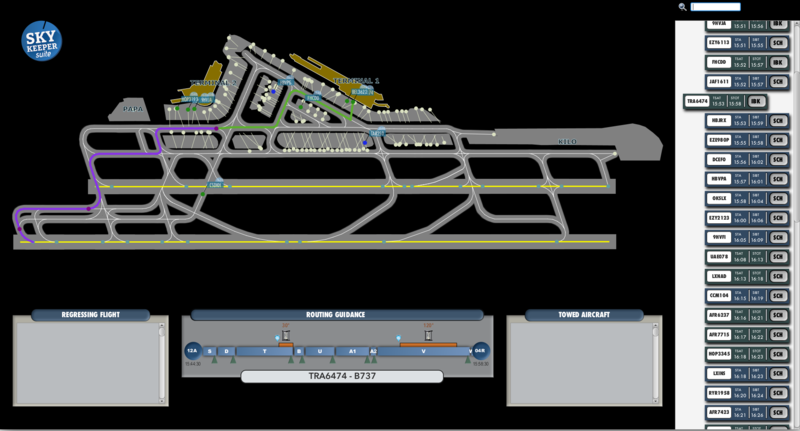 Air traffic data is used to calculate accurate ground movements and routes in order to optimize taxiing times and provide deconflicted ground routes. SkyKeeper® SMAN reduces taxiing time by up to 30% by using our Artificial Intelligence algorithms. Enriched visualization for the controller.